Students, faculty, and staff at Harvard Medical School held a 15½-minute die-in at the school’s Boston campus on Wednesday. CAMBRIDGE — Students at Harvard Law School, joining their counterparts at a pair of other leading universities, have asked that final exams be postponed for students who have been “traumatized” by two recent grand jury decisions in Missouri and New York, and who have focused their energies on protesting racial injustice. Law students at Columbia and Georgetown universities have made similar requests in light of the nationwide protests over the fatal shooting of Michael Brown, an unarmed black teenager, in Ferguson, Mo., and the choking death of Eric Garner, an unarmed black man on Staten Island. In both deaths, grand juries decided not to indict white police officers, sparking national protests. The Harvard coalition, which includes a range of minority student groups, said the law school delayed exams in 1970 for students who participated in protests against the Vietnam War, and has policies in place for students who have personal emergencies that interfere with exams. A spokesman for the law school said Wednesday that a longstanding exam deferral policy allows for “individualized consideration” of any request. “Our staff is available to consider all such requests and, more importantly, to provide students with the support they need,” said spokesman Robb London. Administrators have also provided students options for counseling and general support. On the Harvard law campus Wednesday, several Harvard students voiced support for extensions, saying people who had devoted significant time to civic activism deserved extra time to prepare. Njoroge said that law students are understandably moved to protest against what they see as racial injustice in the criminal justice system. “We’re supposed to be learning about justice,” he said. But others were dismissive, echoing commentators who have mocked the requests as an absurd — and convenient — overreaction. The student asked to remain anonymous, saying his opinion would not be well-received on campus. Other students said they doubted that anyone would exploit the situation unnecessarily. Many students had exams Wednesday, and said they had been too busy studying to follow the debate. “I’m just plowing ahead,” said one student. “I have an exam right now!” said another, as she hurried through the rain. The grand jury decisions have galvanized college students, and earlier this month, hundreds of students and community members protested in Harvard Square, and some staged a die-in by laying in the street. On Wednesday, students at Harvard Medical School staged a similar protest, as dozens and students were joined by faculty and staff in a 15½-minute-long die-in at the school’s Boston campus. 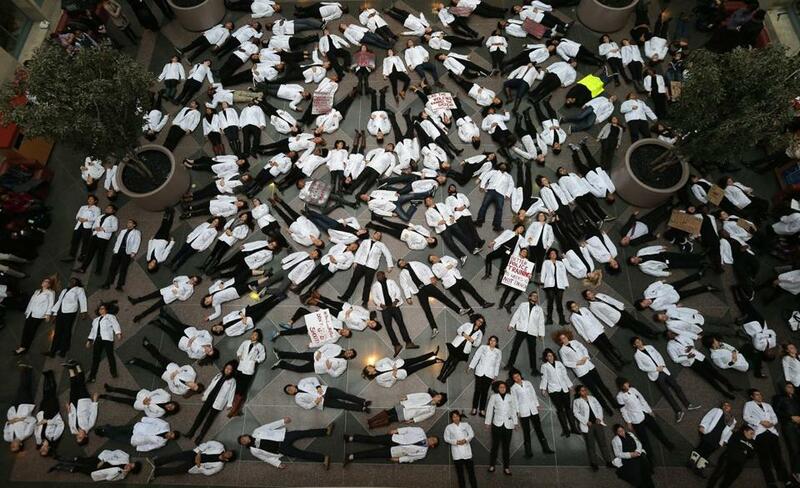 The demonstration was part of a national campaign by medical students against the grand jury decisions. Nancy Oriol, the dean for students, said she and medical school dean Jeffrey Scott Flier addressed the gathering of about 100 students after speeches from several students. The students — mostly first- and second-year students — then lay down, covering the floor of the atrium. The students stayed on the floor for 15½ minutes: 4½ to represent the number of hours Brown’s body lay on the ground, and an additional 11 minutes to represent the 11 times Garner, the man killed in New York, told police he could not breathe before he suffocated.